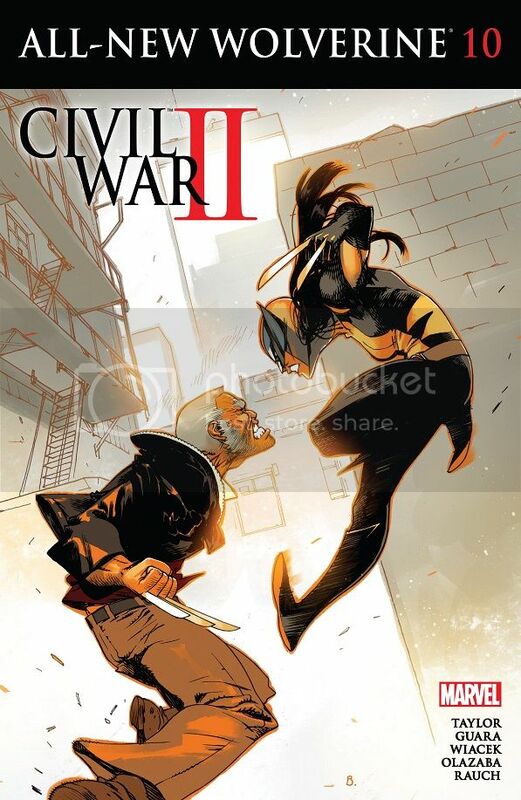 The Civil War II tie-ins are upon us in full force this week, so let’s kick things off with the otherwise stellar All-New Wolverine (how long before we just call her Wolverine?). Laura gets her very own Ulysses vision in this issue, but first we take some time to goof around. While the girls deal with Old Man Logan at their apartment, a couple of burglars climb in through the open window. Everybody has a good laugh that burglars would wind up in this apartment with three Wolverines, but the laughing stops when one of them pulls out a gun and shoots Jonathan the Wolverine (it’s just a scratch). Gabby goes nuts and attacks, with Logan and Laura batting clean up. They make short work of the burglars (without killing, as Laura insists), then return to their business. Logan spends some time with Gabby and reveals she’s hiding some kind of secret from Laura, but when Logan speaks with Laura later, she doesn’t want to know. Still, Logan clearly has history with both girls, and they’re starting to peel back the curtain. 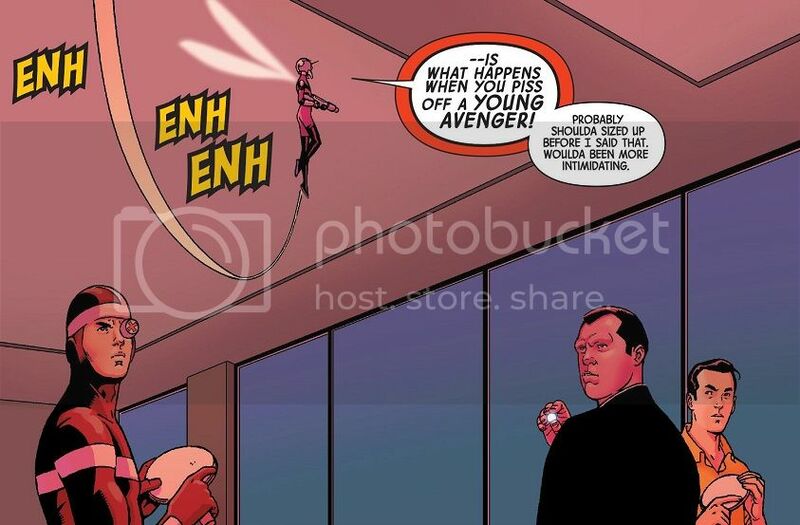 Or they would, if Maria Hill and Captain America didn’t suddenly show up and surround their building. It seems that Ulysses has had a vision where Logan kills Gabby! First of all, it’s a shame about the art. This was a really sketchy fill-in job, and it’s a shame that the regular artists had to take a break. Hopefully this mean’s they’re just skipping the Civil War II tie-in, and will be back with more greatness in a few issues. Guara does an acceptable job, and the art grew on me as I read the issue, but it’s still a little jarring. Fortunately, the character work is strong enough to make up for any artistic missteps. We get some nice bonding between the three Wolverines, and another strong outing for Gabby. Unfortunately, this issue kind of spins its wheels. Taylor is clearly building to something with Old Man Logan (at least I think so), but instead of any real revelations or big moments, we get a fight against a random pair of idiot burglars. The characters even laugh at how unlucky they are to pick Wolverine’s apartment. And then the issue breaks into several pages of fighting against a pair of completely unmatched nobodies. Even Jonathan survives with barely a scratch, so what was the point? It feels like Taylor is killing time with this issue. The cliffhanger might lead to a nice tie-in, but he apparently isn’t in any rush to deal with Ulysses’ vision or deal with Old Man Logan’s drama. There’s some strong character work in this issue, but nobody really has anything meaningful to do or say. Just like I’d hoped after the end of last issue, this new one kicks off with a big team rescue mission! Spencer and Rosanas have been building up to this issue for awhile, and it really pays off. After Ant-Man was captured by the Cross family at the end of last issue, Cassie Lang tries to marshal the troops for a rescue — but since most of them are hardened criminals, they take off. Still, Cassie, Darla, Giant-Man, Grizzly and Machinesmith mount a ‘smash & grab’ rescue. They burst into the Cross building and Cassie reaches her dad for a big, awesome rescue (with a little secret help from the Beetle, who doesn’t want anybody to know she’s really a nice person). The bad guys are defeated, Scott Lang is saved, and Darla finds out that her reality TV show camera drones have been running this whole time — so yep, the cops are waiting for the burglar Scott Lang as he steps outside. Uh oh! This issue was a blast! Everything came together in a great action comic, with thrills, laughs, fears and twists! Spencer and Rosanas did not get lost in the big cast they’d given themselves, and everyone gets used to their full potential. I loved Beetle’s sneaky return. I loved Darla loyalty and fear. I loved Cassie’s heroics. And I especially loved Grizzly. That guy has never been better. Nick Spencer has got to love it when a plan comes together. He set up the fact that Scott is back in prison way back at the beginning, and he set up the fact that Darla has these television camera drones flying around, then brought them together splendidly. I have asked myself whether or not Darla’s TV show as filming this whole caper, and sure enough, that’s exactly what Spencer wanted me to ask! 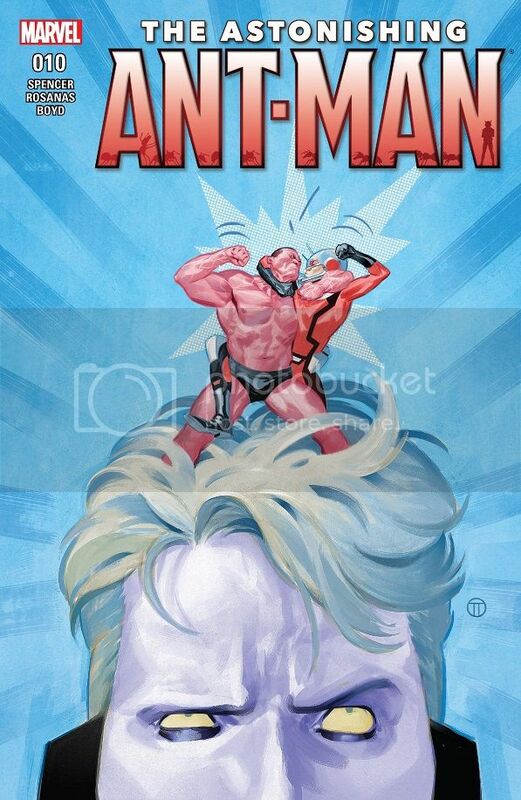 He brings all of his Ant-Man work together in a great crescendo, delivering a fun, exciting and shocking comic book. Fun shocking. Eh, King is losing me fast. He’s focusing way too much on his newbie heroes, Gotham and Gotham Girl. And Duke Thomas hasn’t been seen since a brief appearance in the first issue. I’m starting to get the feeling that Duke’s new role in that yellow Batsuit was the idea of Scott Snyder, and King has zero interest in following up. What a shame. When Gotham was a young lad, his parents were mugged in an alley, but Batman swooped in and saved the day. The boy, Hank Clover, became obsessed, and his little sister, Claire followed his example. The two studied, trained and volunteered overseas in an effort to became super awesome, a la Batman’s example. Then one day, while overseas, they asked their parents to wire them a large sum of money. A short time later, the pair returned to Gotham City with super-powers, and then Gotham and Gotham Girl showed up. Batman learns all this while posing as a federal agent investigating the parents. Then later, he joins Gotham and Gotham Girl in saving people from an explosion on a bridge. He gives them the green light to keep doing good while he investigates the Monster Men. But no sooner do the pair respond to another explosion than they’re ambushed by Hugo Strange and Psycho Pirate. You know what I hate? When DC rips off Batman’s origin and gives it to another hero or villain. It’s hackneyed and lame, and doesn’t make the new character stronger. But here we go, giving the same origin to the so-far uninspired Gotham, and then just tacking on his little sister for the fun of it. All of this was told to us by a rather heavy-handed narration from Gotham’s father, one of those monologues about how Gotham City is all gritty, and you’ve got to be a special sort of snowflake to embrace and live in that grit, or something like that. Some writers really love to go on and on in dense narration about Gotham City. 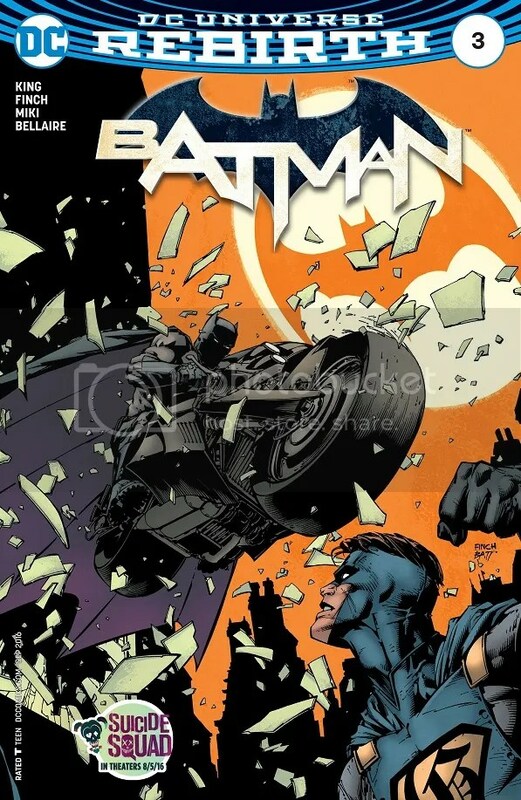 Batman might as well be a supporting character in this comic. And that might be OK, if Gotham and Gotham Girl were at all interesting. Their names are awkward, their powers are uninteresting and their costumes are lame (though I do like the color schemes). Three issues in, seeing them earnestly swoop their way around Gotham City has not yet caught my imagination, and I don’t particularly look forward to the two of them becoming victims of Strange and the randomly inserted Psycho Pirate. I’m probably just being picky, but Tom King has not yet won me over on why his two new earnest superheroes are worth my time, or worth stealing the spotlight from Batman and Duke Thomas. None of the energy and excitement of Grayson has carried over into King’s Batman (except during the first issue), and that’s a damn shame. At least Finch had probably his best issue yet! I sadly missed out on most of Faith’s debut mini-series, mostly due to laziness. But I had the issues and I read them all in preparation for the launch of her new ongoing series! Hooray! Faith is trying to live her life in Los Angeles after her first big solo adventure in her mini-series. 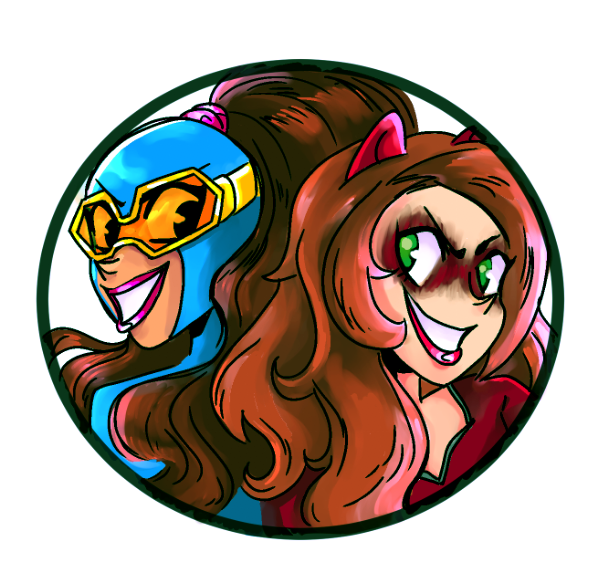 She works at Zipline, a Buzzfeed clone, under the secret identity of Summer Smith. Some of her co-workers know she’s Zephyr and some don’t, and it’s starting to get kind of stressful. Her boss wants her to start writing a column as Zephyr. And when she tries to catch a burglar one night, he shoots at her with some fancy laser weapon, and then the cops can’t really arrest him because there’s no evidence of the break-in. Things really aren’t going well. But then Faith gets an invite to do a photo shoot with her Hollywood crush, Chris Chriswell! That should be good, except that he’s secretly a super-villain, and he injects her with a knock-out drug! Comic Review: 8/10 – Very Good. 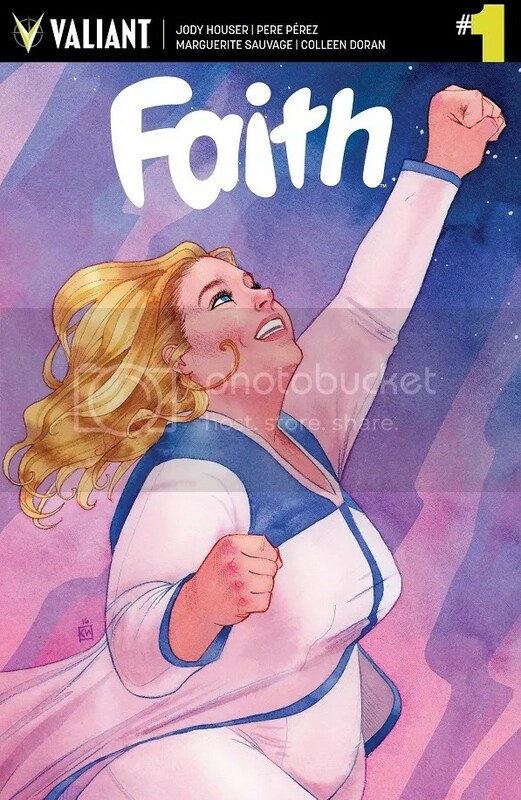 Just like the mini-series, Faith is a fun comic. Houser really presents a personable and engaging main character, giving Faith plenty of personality, quirks, heroism and a solid supporting cast and world. Zephyr is an entertaining superhero, and I look forward to her ongoing adventures. Whether she’s enjoying a game night with friends, struggling with the troubles of her secret identity or wondering about the fashion ranking of her superhero costume, she is just a really relatable character. Perez’s art is really good and captures the character and her life pretty flawlessly — though if I’m being honest, I think I preferred the art on the mini-series. And if I’m being totally honest, Sauvage does the best with the fantasy sequences. I can see why the main series couldn’t be in this style, but it’s still a great quirk for the main character. They fit in quite well with her personality and style, and they really add up to a great bit. That cliffhanger ending was really neat, too. I regret not following Geoff Johns’ Justice League in the New 52. I guess it got really good. Perhaps I’ll make up for that error reading Bryan Hitch’s new series…though I did recently give up on Bryan Hitch’s Justice League of America. I just don’t know what’s wrong with me. Massive earthquakes have been hitting major cities across the globe. All the fault lines in the world are shaking, and the Justice League is out in force. Everybody’s helping out some major city or another. Then all of the various people they’re helping start talking like a hive mind, warning and threatening the Justice League that something big and dangerous is coming! Wonder Woman says she’s ready! This issue was fine. Hitch is great at big, epic art, and his story seems to follow suit. He’s building to this big, crazy story, and he and Daniel do a fine job bringing it to life in these pages. I can’t necessarily say I completely bought into the idea that every fault line in the entire world was going crazy, but they did their best to really up the stakes. 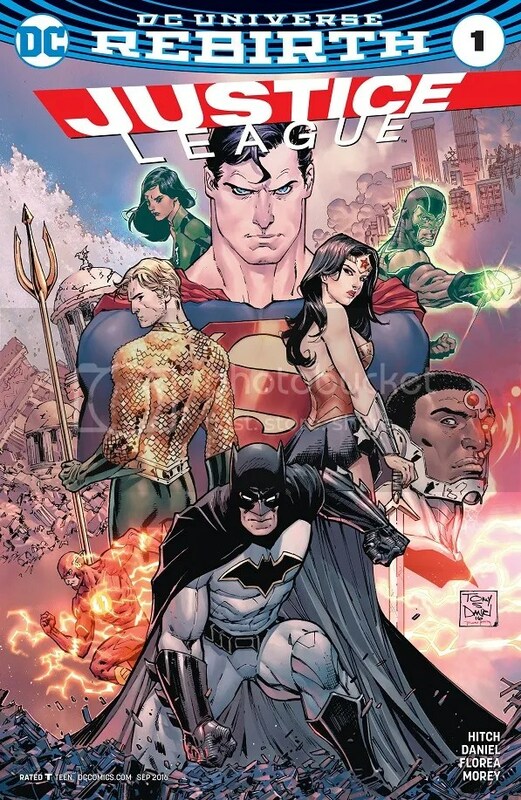 Unfortunately, most of the Justice League members spend the issue apart, so we don’t get any really good team dynamics. And the story stops just as its getting started. This was more of a prologue, really. Everybody gets a little showcase of how they save the day, with hints of the larger threat. That’s good enough, I suppose. Taking a break from the ongoing story, Higgins delivers a rather fascinating one-shot. All the praise I’ve been heaping on this comic for how it digs deeper into the characters, and I never expected it to go this deep! Before Rita picked Tommy for the Green Ranger, she offered the job to Zack! She kidnapped him after a battle, then gave him the ‘I’m not really a bad person’ speech. She tried to play on Zack’s jealousy that the Red Ranger gets all the acclaim. She offers him the Green Ranger power and promises they’ll make the world a better place. Zack is tempted, but he doesn’t fall for it, and makes his escape. Zordon asks Zack to keep this under wraps until he figures out what Rita is up to, and Zack rejoins his friends, who thank Zack for saving their bacon in that day’s big battle. This twist is utterly fascinating, and I just didn’t see it coming. I love that Higgins has thought about both the future and the past of the rangers, weaving twists and fascinating character dynamics that I would have never expected. I have loved how he’s made Zack a big character, and issues like this show just how deep that rabbit hole goes. This issue helps to fuel the animosity between Zack and Tommy in the regular series, while fleshing almost everyone and everything out a little bit more. Just seeing Zack hang out in Rita’s palace was neat, and Higgins delivered a few more awesome twists. Goldar claims that Rita only started making her monsters grow after Zordon started using Zords. And Rita is also being haunted by a voice that predicts that Tommy will betray her. 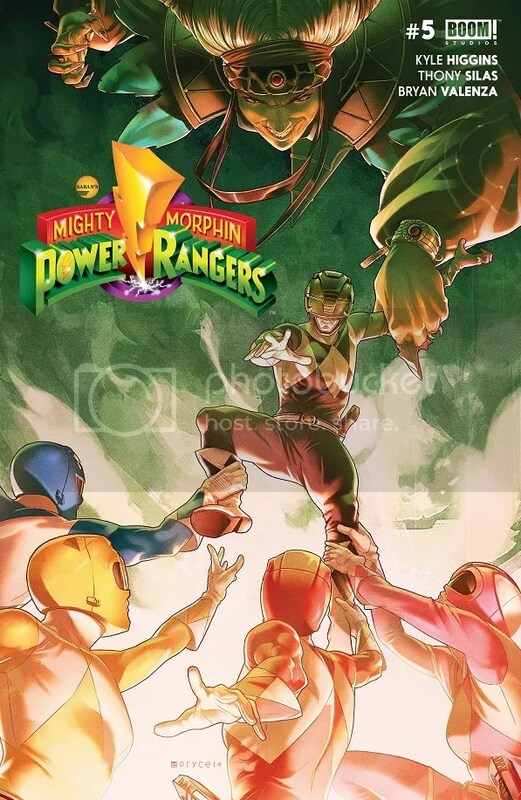 I hope this series has some real legs and goes the distance, because Higgins is doing everything I could possibly want from a Power Rangers comic. Though it would be nice if they found some stronger art. Silas’ fill-in work is far from the best it could be. This issue, right here, is a gold standard example for a Big Event tie-in. Leth probably didn’t plan on She-Hulk being a major casualty in a big company crossover, but she’s got to roll with those kinds of punches, and she does it like a pro! Patsy finds out that her BFF She-Hulk is in a coma after the events of Civil War II #1. She goes to visit, but the doctors eventually shoo her out of the infirmary. 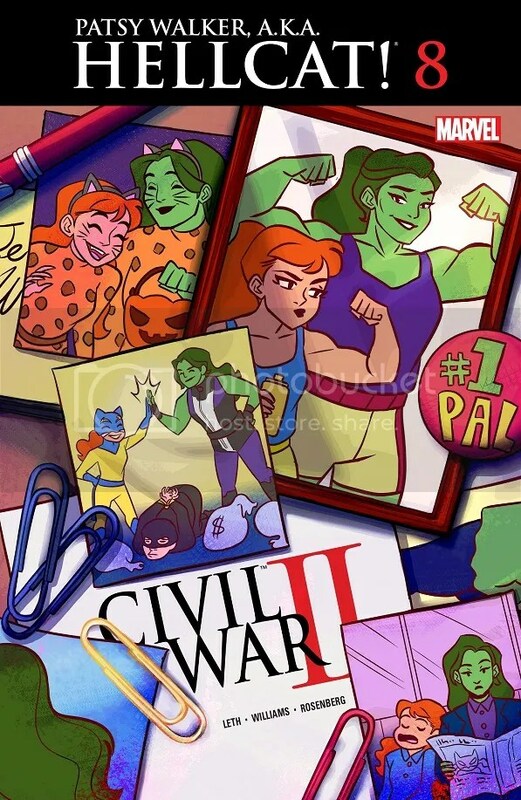 Patsy doesn’t know what to do with herself, so she gathers up all their friends and supporting characters to fill them in on what happened, then they all go out for drinks to share solid She-Hulk memories. 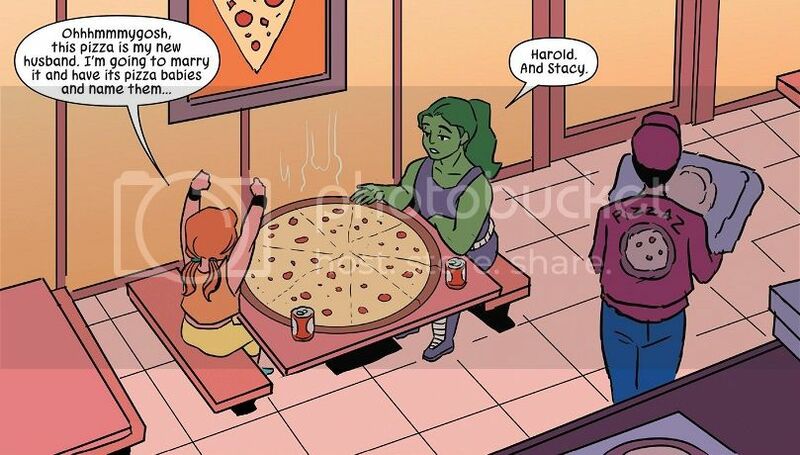 Patsy even loses herself in a fun memory where they stopped a mugging and then went out for a giant pizza. Afterwards, the landlord of Patsy’s building asks her to move into Jen’s old office in an effort to expand her temp agency and bring in more money. So hopefully things are looking up, but for now, everybody’s kind of sad. Also, Jubilee shows up. While most Patsy Walker issues are a joyride of fun and adorableness, this issue gets the chance to stretch Leth’s dramatic muscles. She pulls off the change with aplomb, keeping Patsy’s cartoony style, while still talking about some serious issues. Williams is also more than up to the job. The creative team came together to deliver one heck of a knock-out tie-in, taking the events of Civil War II and making them personal. Fortunately for us all, they also find time to be their special level of adorable. That flashback to the mugging and the pizza was great. But the real heart, of course, is in seeing Patsy react to tragedy. The character remains a uniquely amazing person, whether she’s being awesome or being sad. I don’t want to see Patsy Walker bogged down by too much sadness, but it’s nice to know that everyone involved can rise to the challenge when it crashes down into their lives. 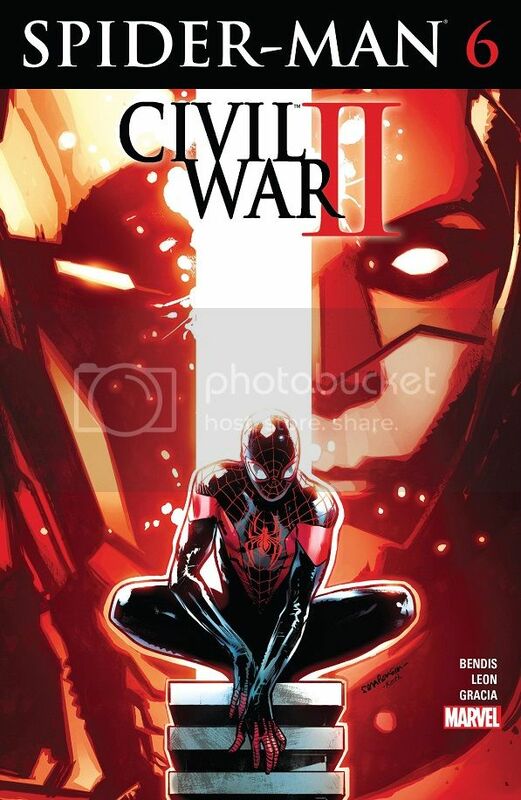 You’d think that the Civil War II tie-in would be extra special in a Bendis-penned comic. Well…not really. I suppose he’s able to explain the issue better than other writers, but that’s about it for this Spider-Man tie-in. Miles, Ganke and Fabio talk about all the drama that’s come between them, largely settling the dispute and making Miles comfortable with the whole secret identity thing. They also talk about the fact that Ganke keeps getting put into the friend-zone by girls. That’s very frustrating. 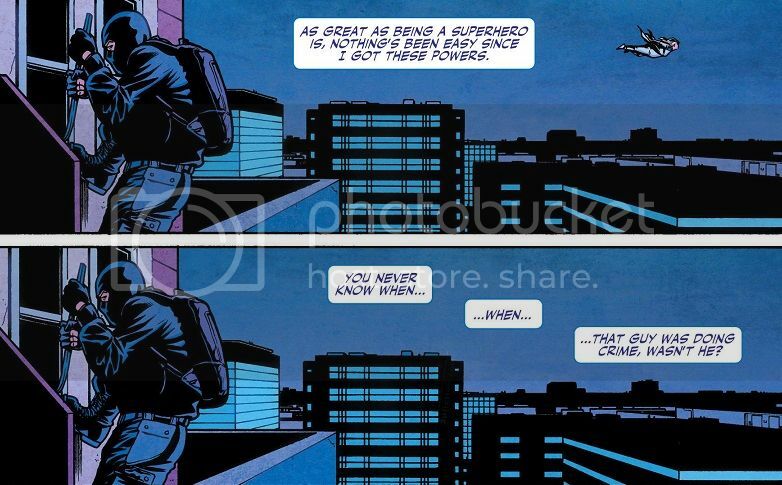 Meanwhile, Jessica Jones is spying on Miles for his grandmother, until she’s chased away by the school principal. Miles’ mom goes to see Jessica to try and pay her to drop the investigation, because she’s too afraid of just confronting her own mother. Jessica won’t break her contract, but Rio begs her to reveal Miles’ secret. Meanwhile, Iron Man contacts Miles for a chat about Ulysses and seeing the future. Tony spells everything out to the young Spider-Man, and Miles finds himself struggling to figure what this could possibly all mean. He later goes to his dad for advice, and his dad suggests Miles reveal his secret to his mom. This issue was a nice mix of the good and the meh. We had some great character building, fitting Goldballs into the Miles/Ganke dynamic, while adding some new fruit to the whole shebang. Seeing Miles and Fabio help Ganke get a girlfriend would be a pretty great subplot. Likewise, I enjoyed the scenes where Rio went to great lengths to not talk to her mother. That’s some more solid character work. This whole series has been pretty low key, but at least Bendis is working with a nice and entertaining cast. Unfortunately, there’s also a big piece where Iron Man lays out the pros and cons of Civil War II to Miles, and that just wasn’t very interesting. I suppose it puts a lot on the kid’s shoulders, and that should be fun to watch…but it hasn’t amounted to very much just yet. Posted on July 23, 2016, in Batman, Comics, DC, Marvel, Reviews, Spider-Man, X-Men and tagged All-New Wolverine, Ant-Man, Astonishing Ant-Man, Faith, Hellcat, Justice League, Mighty Morphin' Power Rangers, Miles Morales, Patsy Walker, Patsy Walker a.k.a. Hellcat, Power Rangers, Scott Lang, Valiant Comics, Wolverine, X-23. Bookmark the permalink. 1 Comment. Wolverine was great. I want an issue told entirely from Jonathan’s perspective. Yeah yeah, a bit of a rip-off of the Pizza Dog issue of Hawkeye, but I don’t care, Jonathan the Unstoppable is awesome. 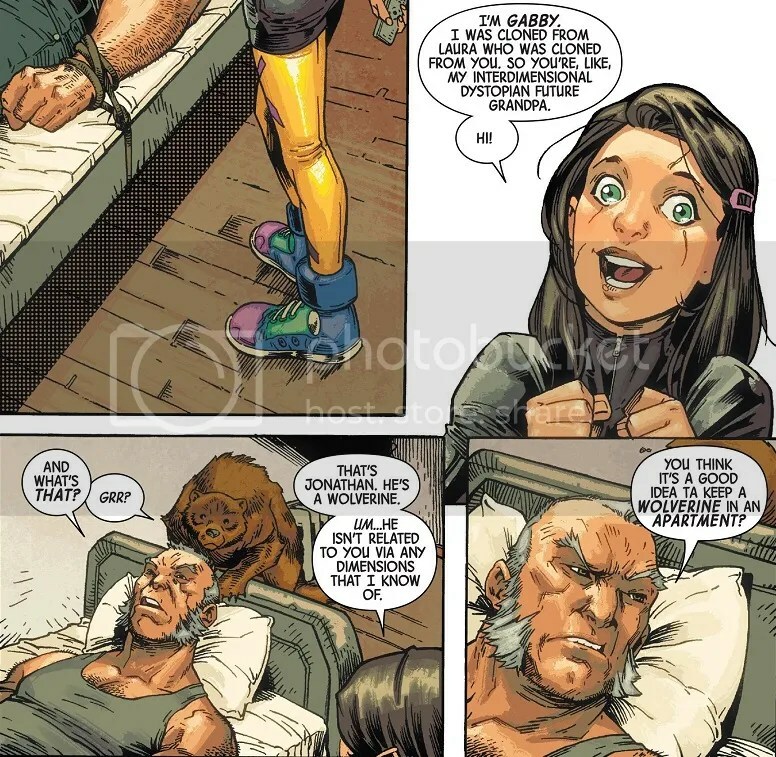 Also, Logan was always at his best when interacting with teen girls, so I was happy to see that here. Ant-Man was fun. Some cool stuff. I like Beetle secretly being a nice person. Hellcat was so good. Oh man, right in the feels. Right from the first page. And then the panel of Jen in the hospital bed. “I know. Believe me. I know.” And then we got humour mixed in with it all to make it all even sadder. The Catball Special, which is the most adorable Patsy image ever. I loved this issue. Spider-Man was fine. It’s fine.